This entry was posted on November 15, 2018 at 4:40 pm and is filed under Bike stuff, Cyclo-cross. You can follow any responses to this entry through the RSS 2.0 feed. You can leave a response, or trackback from your own site. Sort of like investing upfront to enjoy the benefits later? Mebbe not? 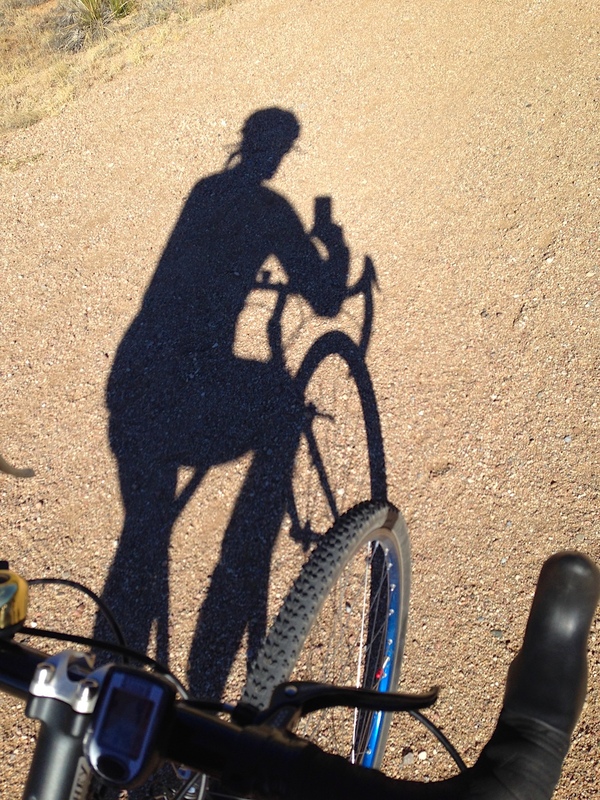 Anyhoo…..glad to see you outside and keeping that highly-toned body in CX-ready shape. Your comment about you and your shadow brought some of my long-debilitated brain cells to life as I remembered the great Harry Nilsson’s “The Point….Me and My Arrow”. No riding here today on MTB trails in the Bibleburg area, as we got a foot of snow in the last dump and are just now clearing. Roads are fine; but, I don’t enjoy the David vs.Goliath challenge of a road bike vs. a car/truck. Odds are against you if you’re on the road bike. Yep, JD, the idea is to start cold as it encourages vigorous exercise (or anyway, the feeble variety of which I remain capable in my dotage). I haven’t thought about that Nilsson tune in forever. I think it was on a loop at a friend’s house in college. If that snow keeps up, you’ll need to get yourself a fatbike to plow through the drifts. Wear a Santa suit and p’raps the neighbors will invite you in for a dram of this and that. Who knows what evil lurks……..? After battling various ailments, that included donating a fair sum of my disposable income to dentists that kept me off the bike for a week two wheels with me on top will be on the roads tomorrow. Time to put some more miles on the Double Cross Disc. The last time it got out including 31 miles of rollers. I like it more every time I ride it, but sooner or later that ten speed 105 compact crank is going to get re placed with one of these with 44/28 chainrings. Jeez Louise, Paddy me boyo, whatever did they do to yis down to the tooth dentist? My man Hal has been in and out of the dentist’s office as well, as has his boy. Herself has been in a couple times too. I sniff a conspiracy. Or is it just the laughing gas? Good morning. It started as a general ache in upper right jaw. Then it localized on one tooth. I assumed it was an abscess or perhaps a cavity under the crown. Went to my regular dentist, and he could find nothing wrong. He referred me to an endodontist, and he also found nothing but gum irritation. They prescribed antibiotics and a prescription mouthwash. It seems to be improving. It is most likely a conspiracy because root canals cost $1K! When will whoever is in charge understand that dental care is medical care? The likes of thee and me are not qualified by training or temperament to keep what little money we have acquired. The Suits will relieve us of this responsibility by passing it along to its proper owners. Meanwhile, I’m glad to hear the thing seems to be resolving itself without extreme medical intervention. Whatever you go in for, it always seems to fall just outside of the old insurance policy. Herself and I have recently endured a couple beatings of this nature and it makes me wonder where I left my old torch and pitchfork. I used to believe in the “start out cold and you’ll warm up” mythology but perhaps the myth dies when you get old? It’s like the “go faster, you’ll generate more heat and get warm” idea. The faster you go the more windchill factor you face, no? Or is it just me? So far no dealing with any of that here in Sicily – shorts and short sleeves yesterday under sunny skies. I find the “start cold and warm up” theory remains valid, but I’m less inclined to stick it out until the furnace clicks on. This is one of the reasons I keep running a couple days per week. If it’s truly vile outside I can pound ground for a half hour and reward myself for my fortitude afterward by eating everything in the house. Perhaps I’ve now spent too much time in Sicily during the winters as it seems I have no tolerance for being cold outside. But now I don’t care since if all goes well, I won’t ever spend any time in a place where it’s cold outside. 34 degrees here this morning. my commute is only a mile and a half which isn’t really time to get warm but is plenty of time to get cold. my go-to method is to put the bike in a big gear and stand up and pedal without pushing too hard to keep the speed down. working those big muscle groups certainly boost the body temperature.